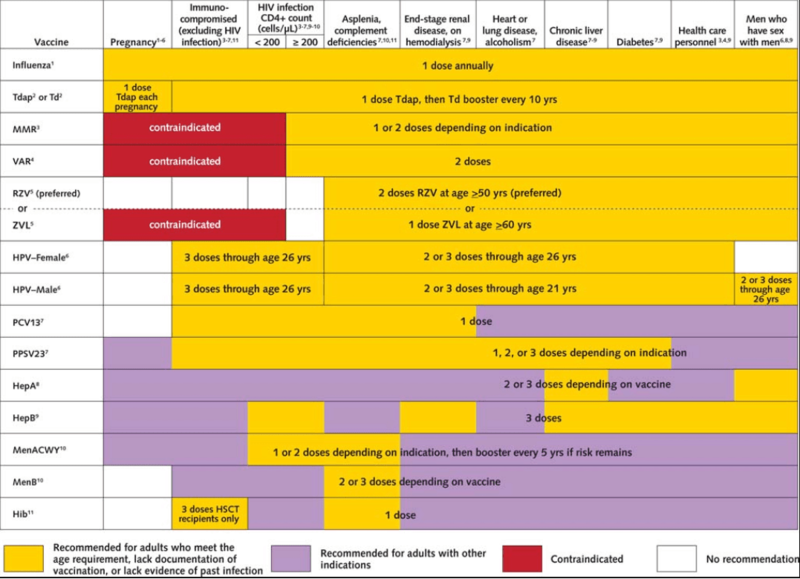 The Advisory Committee on Immunization Practices (ACIP) of the Centers for Disease Control and Prevention (CDC) has issued its 2018 Recommended Immunization Schedule for Adults Aged 19 or Older, and was recently published in Annals of Internal Medicine. Give two doses of RZV 2 to 6 months apart to adults age 50 years and older with competent immune systems regardless of a history of herpes zoster or receipt of the zoster vaccine live. Give two doses of RZV 2 to 6 months apart to previous recipients of ZVL at least 2 months after ZVL. For persons age 60 years and older, administer RZV or ZVL, with RZV the preferred option. Additional vaccines on the schedule include those for hepatitis A and B, varicella, influenza, and human papillomavirus, among others. ACIP offers recommendations for each based on age, medical comorbidities, and contraindications, with considerations for specialized populations. The goal is to make adult immunization routine practice by encouraging clinicians to evaluate vaccination standing of adult patients at each clinical visit; recommend and provide those vaccines as needed; and document vaccine administration in local or state information systems, which can aid in clinical decisionmaking both at the point of care and on a broader level. In another new recommendation, the 2018 ACIP guideline endorses administering an additional dose of MMR during a mumps outbreak to at-risk adults previously vaccinated with two (or fewer) doses of a mumps-containing vaccine. The study authors also note that more needs to be done to encourage vaccine uptake in adults. Despite modest increases in vaccination coverage rates observed in some adult groups in 2015, overall vaccination coverage rates for US adults remain low. Except for a steady rise in zoster vaccination among persons age 60 years and older, no sustained increases in vaccination coverage have occurred in the past few years.